Menu Labeling: Good for Consumers, Bad for Restaurants? March is the Academy of Nutrition and Dietetics’ National Nutrition Month, and it comes at a time when nutrition, or at least information about nutrition, is very much on the minds of many restaurant operators. New federal menu labeling laws expected to take effect next year require chain restaurants to post calorie counts for each item on printed menus and menu boards. That follows a series of newly enacted local-level rules that require chain restaurants within those jurisdictions to follow similar rules. Backers of these measures tout them as a way to help consumers make more health-conscious choices, but opinions are strong on each side about how far restaurant operators should be expected to go to disclose nutrition info. 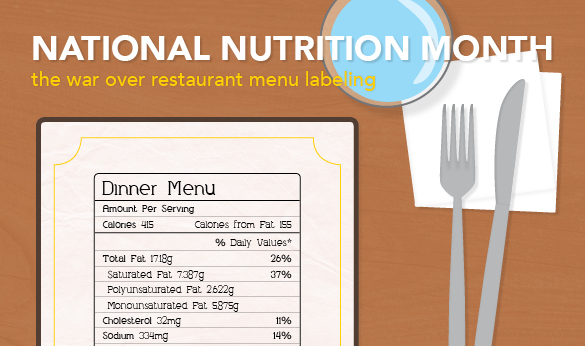 Here’s a rundown of some of the latest developments in the menu labeling debate. At the end of February, the New York State Supreme Court upheld a New York City Board of Health rule requiring restaurant chains with 15 or more locations to print warnings on their menus next to items containing 2,300 or more milligrams of sodium, the FDA’s maximum recommended daily intake. That ruling came out of a lawsuit filed in December by the National Restaurant Association on the basis that the requirement places an undue financial burden on operators who must foot the bill to obtain the sodium contents of each of their items and update their menus. On March 8, just a day before those rules would take effect, a New York State appeals court put a temporary stay on the law. The new salt-labeling rules are the latest in a decade-long war waged by the City of New York to force chain restaurants to disclose their menu items’ nutritional information in a way that’s all but impossible for patrons to ignore. The opening salvo in that war came in 2006, when the NYC Health Department amended the city’s health code to require restaurant chains to display calorie counts on printed menus and menu signs. After two lawsuits filed by the New York State Restaurant association, partially on the basis that the rules violated First Amendment protections, the law was made permanent in 2008. Those are just a few prominent examples that are part of a national trend towards menu calorie labeling. Similar measures have been passed in California, Massachusetts, and Oregon, in addition to local codes in Philadelphia and Nashville. The Center for Science in the Public Interest has prepared a map showing each state’s menu labeling requirements. The new rules were originally set to take effect in December 2015, but were pushed back in the summer of that year to the end of 2016 and once again in the middle of March. Now, the rules are set to take effect a year after the FDA issues its final guidance to the industry, which is expected to happen by the end of summer. These new rules will also apply to other foodservice venues, including coffee shops, movie theaters, convenience stores, ice cream shops, and many grocery stores. Another clause in the amendment requires vending machine operators with 20 or more machines in operation to display calorie counts for items served by the machine. The latest development in the war over restaurant menu labeling came at the end of February when the U.S. House of Representatives passed a “Common Sense Nutrition Disclosure Act”. If that bill were to make it into law as it is, it would amend the new federal rules to allow businesses to define their own serving sizes, a practice that opposition claims would make it easy to deceive patrons into thinking menu items are less calorie-dense than they are. The bill would also let businesses that sell most of their food through carryout off the hook, requiring them only to make the nutrition information available online. Additionally, it would protect restaurants from being sued by consumers for failure to comply with labeling laws. In September 2015, the FDA issued a supplemental draft guidance document aimed at clarifying some of the ambiguous requirements set forth in the original copy. Among the highlights that addressed some of NRA’s 2011 requests is a table that lists many common establishments and whether they’re covered by the rule, listing C-stores and movie theaters as covered establishments. On the topic of materials that require labeling, the guidance declared that a menu can be considered “writing [that] can be used by a customer to make an order selection at the time the customer is viewing the writing,” bringing a number of marketing materials, including promotional flyers and coupons, under the definition of “menu” and requiring that they list the calorie information. The guidance also issues a list of food items that covered under the law, in addition to some that are exempt. No matter what your opinion on restaurant menu labeling laws is, they only highlight the growing demand on the part of consumers to be better informed about what’s in food. If your eatery is exempt from the impending Federal rules, but you still wish to comply with the rules as a service to your customers, the FDA has prepared a “Small Entity Compliance Guide” that outlines non-binding best practices instructing owners how to go about labeling their menus. Voluntary registration is free and must be renewed every two years. Because Federal law preempts state and local laws, compliance with these rules may exempt restaurants from certain local rules.